On a day of heavy rains in the Spring of 1990, new local residents David and Jane Reuter attended a fundraiser at the Winona School and Church on Rockhouse Road. Attendees, including the Reuters, brought pies that an auctioneer sold to the highest bidder to help pay someone’s medical bills. David remembers bluegrass-style music provided by a fiddler, banjo-player and others. At the conclusion of the event, those driving north towards Eureka Springs found the low water bridge impassable. Drivers climbed out of their vehicles and congregated at the water’s edge and decided to give the creek time to fall rather than taking the risk. Located in the long, narrow Winona Hollow, the historic Winona building has been a place of learning and worship, as well as voting, meetings, homecomings and weddings. There have also been community pie suppers and dinners on the grounds. If one peruses old maps, it is found that Winona Springs was the name of this community. Besides the school and church, at one time Winona Springs had about 20 houses, a post office, and a mill. I’ve read that George Washington Pinkley had a hand in the building of the Winona School and Church sometime before 1893. His daughter, Luella, married my great-grandfather Walter Weems there in 1901. I live in Winona Township and we used to vote at the Winona School and Church, but it was eliminated as a polling location several years ago. If you were handicapped and couldn’t make it into the building, a poll worker would bring a ballot out. Often, voting on a chilly November morning, a roaring fire in the General-Wesco Jumbo woodstove kept things warm. It was a pleasant and friendly place in which to participate in democracy. I miss it. We now vote in town and it just isn’t the same. Now this historic building is needing a new roof and repairs. An old-fashioned pie supper and silent auction will be held at 6 p.m. Thursday, November 20, at the ECHO Clinic. You can also donate at the First National Bank of North Arkansas or mail donations to P.O. Box 367 in Berryville, Arkansas 72616. I assume the following article is a clipping from the Eureka Springs Times-Echo (probably 1954.) 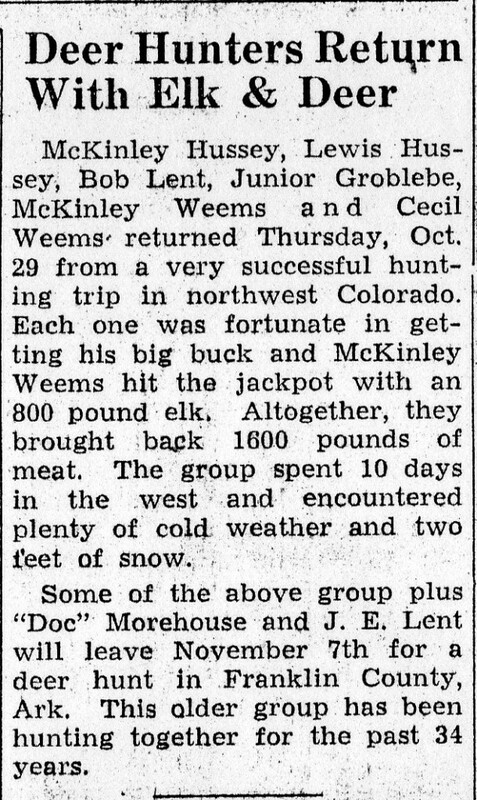 It lists the following as traveling to Colorado to hunt: McKinley Hussey, Lewis Hussey, Junior Groblebe, McKinley Weems and Cecil Weems. The first step is to admit I have a problem: I think I’m living in the past. These old Eureka Springs Times-Echo newspapers keep calling to me and I can’t stop looking through their brittle yellow pages. Many of these newspapers date from before my birth and yet so many of the names are familiar; people I’ve heard about my whole life. The bulk of my habit has been supplied by Kay Kelley. She and Richard had quite a collection of Eureka Springs memorabilia and I was lucky enough to get a couple of boxes of newspapers. Recently, Genevieve Bowman kindly passed along a bundle of old newspapers also. Others have slipped me individual clippings and odds and ends. Sometimes I read the old newspapers so much that I find I don’t have time to keep up with current news. I may not know much of what is happening today, but I can tell you that LB Wilson scored 23 points in a winning effort for the Highlander boys against Reed Spring on November 17, 1967. The main photograph on the front page of the November 23, 1967 Eureka Springs Times-Echo is that of the recently completed statue of the American Mastodon at Ola Farwell’s Dinosaur Park near Beaver Dam. I’m sorry that the park is now closed. 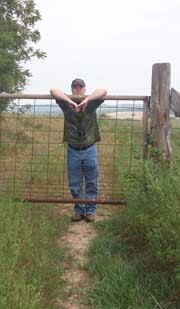 Norma Scates column, Busch News, recounts the killing of a tame deer called “John Deer” the second day of hunting season. His bloody collar was found down behind Huffman’s Rock Shop at Busch. Today, with nearly a thousand killed annually in Carroll County, deer are taken for granted. They are thick everywhere it seems. But in 1967, as the resident deer population was still rebounding, the animal still held novelty value. The 109 hunters that killed deer in Carroll County during the first segment of the November, 1967 season are listed on the front page of the newspaper. Winifred Prior killed a 13 point buck. This clipping is from the October 24, 1963 edition of the Eureka Springs Times-Echo newspaper. 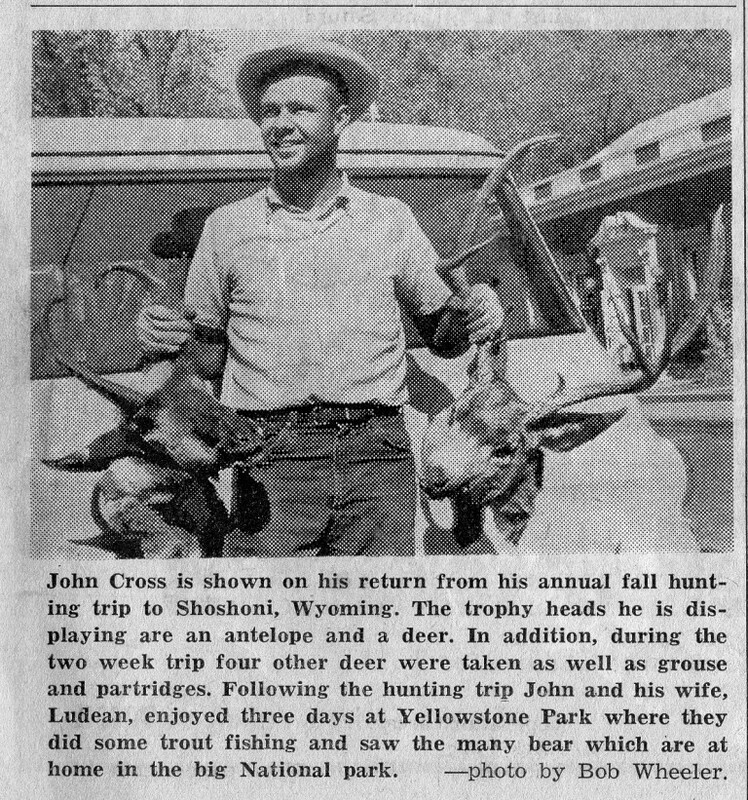 The photograph shows John Cross of Eureka Springs who has just returned from a hunting trip to Shoshoni, Wyoming. Sometime back, I overheard a snippet of conversation between two white-haired men. One was talking about his idyllic youth. He wasn’t a person known to me and I don’t recall all of what he said, except that when he came of age, the world was a simpler and better place, people were honorable, and one didn’t have to worry about, well, much of anything. Or is there something psychological going on here? I think of my own youth as a time of relative security without many complaints. Reagan slumbered on the throne but Marines died in Beirut and a space shuttle exploded.